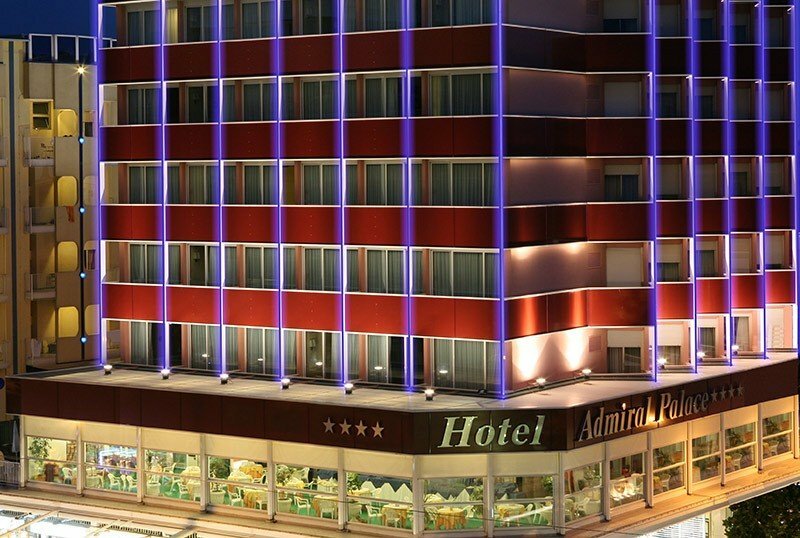 The Hotel Admiral Palace in Rimini is located a few steps from the sea and offers a well-kept and full of services, including: conference rooms, garage, WI-FI, convention with wellness center, excellent cuisine, dishes for celiacs and services for families and children. Accepts pets of all sizes. It is located near the beach on the way of shopping and walking. Simply cross the road to find yourself on the seafront. There are 5 different types of room, all equipped with air conditioning, safe, minibar, WI-FI, color TV, telephone and private bathroom with shower. SINGLE : small but cozy and equipped with all the services listed. EXECUTIVE : with classic decor, they feature a desk, TV with satellite channels, King-size beds in Sommier with natural fiber mattresses, a balcony with sea view and a private bathroom with hairdryer. EXECUTIVE 2.0 : completely renovated with modern style and dedicated to art, have a desk, TV with satellite channels, King Size beds with natural fiber mattresses, balcony with sea view and private bathroom with hairdryer. ROYAL : elegant and comfortable, they are composed of a sitting room with desk, satellite TV and all the Executive equipment, plus a large balcony with sea view, umbrella and sunbeds on the beach and, during winter, bathrobe and courtesy set. JUNIOR SUITE : spacious and comfortable rooms, with new furniture, also available with sitting area with desk, satellite TV, minibar, King size beds, large balcony with sea view and Jacuzzi with bath salts. In the summer guests have beach umbrella and sunbeds on the beach; In winter, tea and coffee-making facilities, a bathrobe and free toiletries. Bicycle hire also with child seat (surcharge), terrace, American bar, conference rooms, reading room, elevator, laundry service. PARKING : discovered at 1 km. from the hotel served by shuttle, underground garage under video surveillance, both subject to charges. CONVENTIONS : beach, amusement parks, waterslide, wellness center, organized excursions, and Beach Village, a water park by the sea with slides, pools, games and entertainment, reachable by shuttle service reserved for hotel guests. PETS : of all sizes, for a fee. A dog sitter is available on request. Near the hotel there is a vet and a pet shop. The beah affiliated with the hotel is also pet friendly. LUNCH AND DINNER : the kitchen, prepared and supervised by Chef Di Stasi, offers traditional Romagna dishes every day, fresh fish and menus for conferences, meetings, buffets, business lunches and lunches and dinners for special occasions. In the hotel : indoor playground area, live entertainment, bicycles with child seats. On request: trusted pediatrician available 24 hours a day, baby sitter. Near the hotel are both pharmacy and medical garrison. In the room : baby coat, anti-fall rails, camping beds and courtesy light. At meals : special menus, dedicated cooking corner for preparing baby food and entertainment during meals, high chairs. On the beach : baby club, mini club and live entertainment. For those who need to organize business meetings, the Admiral offers four well-equipped rooms, bright and equipped with modular space, projectors, telephones, fax, internet connection, photocopiers, overhead projector and radio microphone. The rooms have different capacities, the largest can accommodate up to 140 people. The hotel has an agreement with the beach 58 which has: private cabins, WI-FI, safe, playgrounds, nursery, children's playground area, baby club, entertainment and much more. Come and spend the Easter weekend at the beach. Our offer starting from € 58.00 per person per day, minimum 2 days.